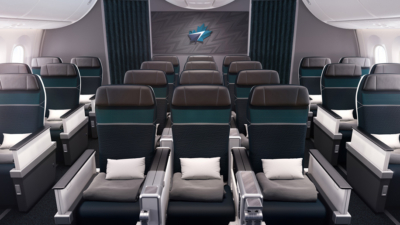 Low cost Canadian airline WestJet will launch an impressive fully flat Business Class service on its London Gatwick to Calgary route from 28th April. It is a 1-2-1 formation. If the seat looks familiar, it is because it is the same one that Qatar Airways uses on its Boeing 787 and A380 fleets in Business Class. It certainly isn’t the sort of seat you’d expect a budget airline to be using. The one thing that differentiates WestJet from a legacy airline is the size of the Business Class cabin. There will be just 16 seats on each aircraft. The upgrade comes as WestJet begins to take delivery of its new Boeing 787-9 fleet. Ten of the aircraft have been ordered, with the next two earmarked for Calgary – Paris and Calgary – Dublin. British Airways is not flying to Calgary this Winter and it appears that it will not return next Winter either. I have seen a report which suggests that the high cost of deicing the aircraft in Calgary each day makes the whole service uneconomic, although that sounds dubious. The British Airways service IS operating during the Summer timetable, from 31st March to the end of October. One thing that WestJet brings to the party, apart from brand new aircraft and an excellent seat, is one-way pricing. If you are struggling to find Avios redemption seats in both directions, you now have the option to fly one way on British Airways and purchase a relatively cheap one way ticket in the other direction with WestJet. You won’t be penalised by WestJet for only buying a one way ticket. Even if you have enough Avios, it might make financial sense to pay cash for one leg if WestJet pricing is low enough. To be honest, the opening fares are not exactly low cost. However, let’s compare that to an Avios redemption. As you can see, you’re getting poor value for your Avios by doing a full redemption vs paying the WestJet prices. If the options are £1,626 return on WestJet vs 150,000 Avios + £651 on British Airways, then your Avios are only worth 0.65p each. An Avios ticket is refundable, of course, whilst the WestJet ticket is not. On the other hand, WestJet offers a small private cabin with just 16 seats of a superior quality and configuration to BA Club World. For 2019 this is very much a theoretical discussion only, however, as there are virtually no Avios seats in Club World to be found to Calgary for the entire Summer. It will be worth keeping an eye on Dublin pricing when that service launches. With no Air Passenger Duty it should be at least £150 cheaper than the London flight and I would expect the reduced demand compared to London to push the price down even further. There are no ‘add ons’ either …. Despite being a low cost carrier, Business Class passengers do NOT pay for luggage or seat selection. WestJet will let you check in 2 x 23kg suitcases for free. Food and drink is free, and you get lounge access, priority boarding etc. And a few airline miles too …. WestJet is not in any of the major airline alliances. However, you can credit flights to Delta SkyMiles, Flying Blue (Air France / KLM) and Qantas, as well as WestJet Rewards. To see a low-cost carrier launch a Business Class seat which is far superior to the British Airways offering is an odd state of affairs. £1,625 to £1,826, which is the current fare range depending on date, is not exactly bargain basement pricing for a return Business Class flight, of course. However, if WestJet ends up offering fares like this day in and day out, even outside sale periods, it will be a serious option for a flat bed to Canada. Another good reason to go to Canada which I have now delayed for TOO long! Be good to get a review on the service as my experience with Westjet for numerous North American flights and one return to New Foundland has been mixed. Had some prettty obnoxious staff on the flights so will be interesting to see how they adapt to offering a more premium service. Their safety briefings are also painful. I know you have to do them and they have tried to inject some humour into them, but they always come off as one big injoke between all the crew that last ages and isn’t funny. Don’t think you can classify West Jet as Low Cost anymore since their pricing, certainly for internal Canadian flights are more expensive than legacy carrier Air Canada, although AC has gone downhill. Agreed. My last round trip to a western Canadian city with WS cost almost £800 a person at end of August/September, without baggage, meals, or seat-back entertainment (all those are extras of course). Not what I call low cost..
Head over to Calgary for Stampede in July – its absolutely brilliant!! I guess West Jet’s prices reflect the cost of deicer fluid!! I’ve flown the BA Calgary route a few times and was due to fly it again in December until it was withdrawn. I think the real reason is a combination of 787 availability and the Calgary economy. Calgary has been hurting for a while due to the very low oil price (it’s a oil city)! This is where WestJet sees a gap for lower prices: BA Calgary route has been pricey compared to similar distance routes. Or in the summer, you could grab drive or train/coach it to GLA and Westjet it from there via Halifax. I’m pretty sure that there was some reward availability in May to Calgary as recently as last week (I’m going in May) – possibly only inbound to LHR – but this seems to have vanished. Maybe it will return. Actually there is availability but the BA ‘Find Reward Availability’ tool isn’t working. Possibly for the same reason BA Redemption Finder isn’t working at the moment. Looks very good. Does anybody know if WestJet intends to fly their new 787-9 on other routes as well? YYZ-LHR for example would be most welcome. Seems like branching out into the business sector is a relatively new direction for them, Perhaps they’ll upgrade other routes later if proves profitable. Is interesting having a dedicated business cabin on a low cost carrier with a 787. Fly Dubai have something similar but they’re all on short-haul aircraft I think. They had very good onward fares to West Coast USA. I’ve seen £550-600 one way to San Francisco via Calgary! Unless I’m mistaken I think the April 20th Date is wrong. I was under the impression that the Inagural flight date for the 787-9 on the LGW-YYC was is going to be Monday 29th April. Just wanted to add that info. Not sure if i’m wrong. Yes, you’re right, sorry. Updated. I think I simply misread the press release yesterday. Don’t we need the new Canadian equivalent of ESTA to fly to Canada now or even transit in Canada on way to US? I’m guessing Westjet may have their own cheaper de-icing facilities in Calgary that their planes can plug into and maybe even heated hangars? Yes, the eTA. Not sure about transit. It only costs about $7 a head I think. Not that new. I got one in April 2016. Cheap and very straightforward from what I remember, and valid for 5 years. Re de-icing I thought that Canadian airports had remote de-icing stations which is more efficient than using trucks and/or de-icing at the gate. I suspect it’s more that the numbers BA is getting don’t compare well with some of the newer US routes like San Jose and Nashville, which are served with similar aircraft. Re the ‘birthday’ Avios. My birthday is 11 Jan and I got 2018 points a few days ago, not 2019…… Now waiting for 2019 for BA’s birthday? Weird. ‘Birthday’ Avios. Hum, I got birthday Avios last year for my birthday and again this week which was very nice. However, neither my wife or any family member got any! BA PR gone wrong? Oh, and I am writing this from Canada. That’s just the one we already knew about – Award Wallet aren’t the quickest at covering these sort of things! A small detail but I don’t think the WestJet tickets include lounge access …. it looks more like a slightly discounted price (10% off the walk-up price at Calgary?) to access some lounges ? Hmmm … the business class ‘what’s included’ list does show lounge access. If this was just a discount it is VERY disingenous.